A crew from Asplundh works to clear fallen trees from power lines Thursday evening in a hard-to-access area. Bob Senter of Central Maine Power shows how much ice accumulated along parts of the Maine coast. 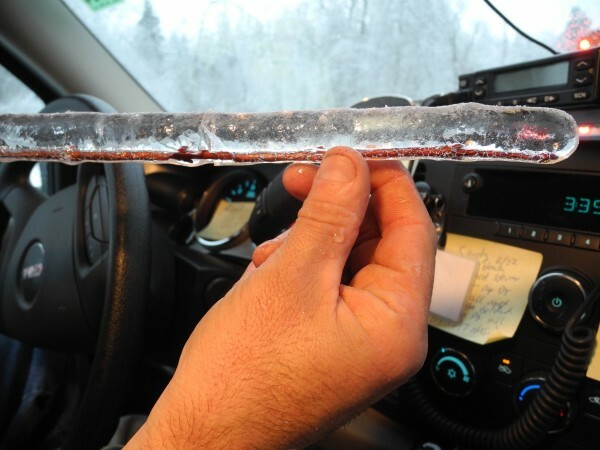 "There's ice down here over an inch thick on the wires," he said. "That's thousands of pounds extra." 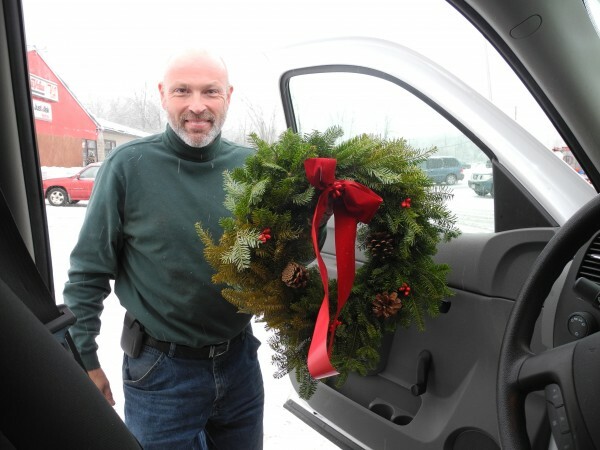 Bob Senter of Central Maine Power shows one of the 50 wreaths a local woman gave to the line workers on Thursday. "That was special," he said. CASTINE, Maine — Bob Senter slowly drives the snow-slicked rural roads of Hancock County, pointing out the broken weeping willows and the bent-over copses of birches that pock the icy landscape. He’d been running on caffeine and adrenaline since Sunday, as his utility raced to try and restore power to the 123,000 customers who lost it during this week’s ice storm. By Thursday, more than 100,000 of those customers were able to turn their lights back on. But the remainder were often houses located down camp roads or in isolated rural areas, in places that crews couldn’t easily reach. To clear and repair those lines, work crews needed to use ingenuity and some nifty tools, including a bulldozer on tracks, to get there. In Castine, ice lay thick on the power lines and everything else — more than an inch of it in some places, weighing down the trees and the wires. It’s hard work to clear it off, especially in a long stretch of tough weather that culminated in frigid temperatures on Christmas Day and a wet, heavy snowstorm on Thursday. Senter said that it’s been clear that Mainers appreciate the utility crews. One woman delivered a carload of 50 wreaths to the workers that morning, and others have given them hugs and thanks. One man brought them a load of coffee and doughnuts. “I bet that’s my 20th coffee today,” he said, taking a swig. As Senter drove the bumpy roads toward one of the work sites, five bells dangling from his rear-view mirror jangled. There’s one bell for each member of his immediate family, who are never far from his mind. Flashing lights from Asplundh bucket trucks illuminated the bend in the road where several men worked to restore power to a single house located deep in the woods. 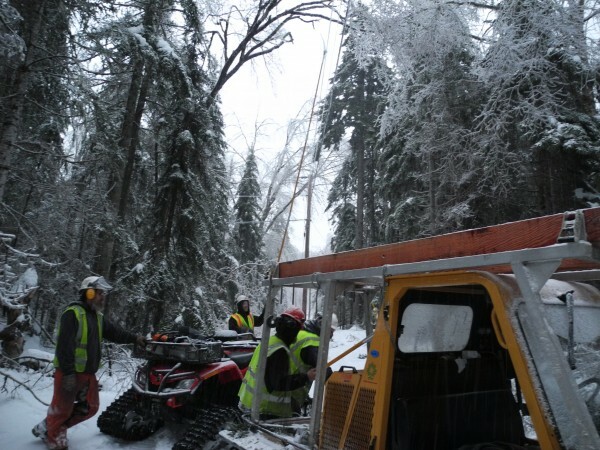 They took long poles to reach the high tree branches, and after CMP workers cut the power, the tree crews from midcoast Maine sawed at the overhanging mess of ice and wood. On the 16-mile peninsula alone, there are hundreds of utility poles and thousands of miles of wire, Senter said. It was beautiful, with snow falling amid pine trees and farmhouses, and the holiday lights of houses with restored power shining softly through the dusk. “It’s a lot prettier with the power on,” he said.